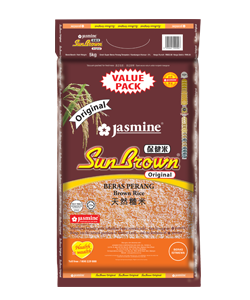 Brown / Health Rice | Jasmine Food Corporation Sdn. Bhd. 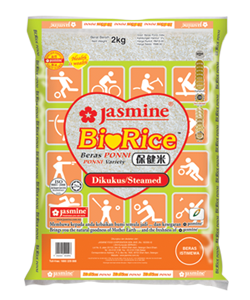 Apart from brown rice, Jasmine’s health rice range include Ponni and Basmathi rice that have been steamed or parboiled. Brown rice is part of the whole grain family where the bran, endosperm and germ are still intact. Compared with white rice, these layers contain a significantly higher amount of nutrients such as fibre, vitamins B1, B3, B6, manganese, iron, selenium, phosphorus, potassium and fatty acids. A local brown rice variety that is of medium hard texture. It is well liked by consumers for its flavor and taste. Grown in Kedah, our very own “Rice Bowl of Malaysia” it contains minerals such as calcium and potassium, vitamins and proteins in addition to other minerals the body needs. It is the beginner’s choice on the journey to having a healthier body. This variety has a higher value of fibre due to minimal polishing of the bran after removal of the husk. Being of a higher fibre value means that it contains even more nutritional benefits. Suitable for those who are determined to enjoy the full goodness of brown rice. This is a unique variety that contains red pigment which boasts of rich antioxidants. This pigment is believed to help to improve the quality of our blood. Nutritionally it is rich in vitamins and minerals that are good for your body. The BlackBerry rice is known as “Forbidden Rice” because legend has it that it was consumed by emperors. It has a deep nutty flavour. Nutritionally it is a good source of protein, amino acids and a host of vitamins and minerals such as iron and potassium. Also known as Sona Masoori, this variety is grown in the fertile data of Tamil Nadu, the rice granary of South India. Due to the high level of minerals in the soil, BioRice is endowed with minerals such as calcium and potassium in addition to protein and various other essential vitamins and minerals. Like all rice, BioRice is cholesterol free and gluten free.